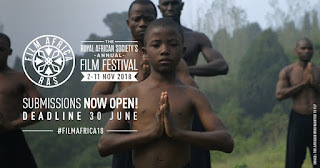 Dates for Film Africa, The Royal African Society’s annual London festival celebrating the best African and African diaspora cinema, have been announced! From Friday 2 - Sunday 11 November 2018 at six venues across London, will be another eclectic film programme accompanied by a vibrant series of events, including director Q&As, talks and discussions; professional workshops and master classes; school screenings and family activities; parties; and our highly popular Film Africa LIVE! music nights. Now in its eight year, Film Africa is a key event in London's thriving cultural calendar. The festival accepts films of all lengths and genres, including features, documentaries, shorts and experimental titles. You can submit via online submissions platform FilmFreeway. Your film may be eligible for our festival awards - The Baobab Award for Best Short and the Audience Award for Best Feature. For more information on eligibility, fees and how to submit click here. The deadline is 30 June 2018. We look forward to receiving your submissions!